Image of the Planar trapezoidal monopole. The printed planar monopole exhibits wider bandwidth than a conventional wire monopole due to the flexibility of the printed monopole geometry. Such printed monopoles are usually microstrip fed and are popular in mobile communications due to their reduced size and moderate to wide impedance bandwidth. The trapezoidal monopole’s increased impedance bandwidth over a square or rectangular monopole is due to the step and/or tapered (bevelled) bottom edges which ensure a broadband impedance transition. 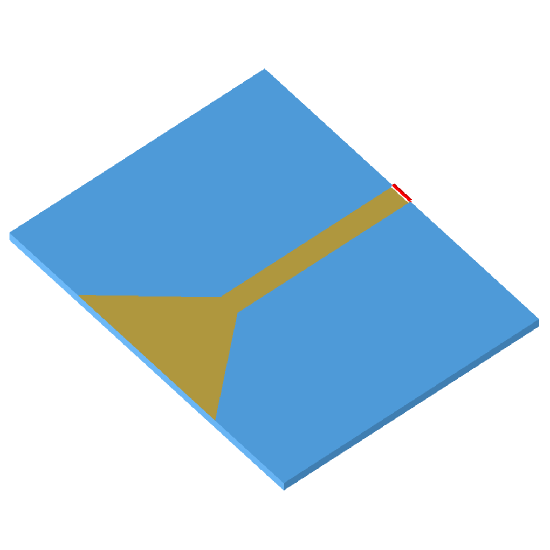 The simplest trapezoidal monopole is the triangular monopole where the base is the same width as the microstrip line feeding the monopole.